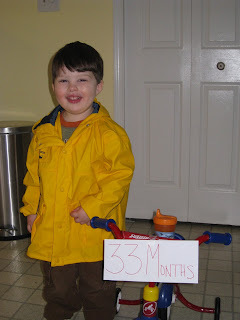 Thirty-three month statistics: Weight: approximately 39 lbs. Length: TBD inches. Diaper Size: 6 Clothes: 3T – 4T depending on brand. February was definitely the month of make believe. Seems like your mind just opened to all of these new possibilities. Within a single day you can be the captain of a ship fighting pirates, a garbage man, or an astronaut. You love for us to sit on the couch as you make the space ship countdown: 3, 2, 1…. Blast Off! You madly press letters and pictures on the quilt that hangs on the back of the couch, as each one symbolizes a way to operate your space ship. You also love to use the dining room chair as a garbage truck. You use a toy bucket and pretend to dump the trash in, then stand on the side of the chair to imitate moving toward the next house for trash pick up. This past week, you and dad had great fun in the morning searching for a make believe “little mousey.” So sweet! March was the month of songs. The ABC’s started in January, but in March your song repertoire exploded. You can and love to sing ABC’s, although you miss M and N. You even sign the part, “Now I know my ABC’s next time won’t you sign with me. “ Other songs and rhymes include: Itsy Bitsy Spider, Mary Mary, Quite Contrary, Teapot, and major portions of many others. April has been the month for manners. While we still do lots of prompting, you have your own little sense of etiquette. You use please and thank-you in many appropriate situations, and we are working on “May I be excused please.” You still sign thank you, sorry, and sometimes excuse me. That sorry sign came in handy this past week when you took a bite out of poor Sophie’s arm when you refused to share your picnic basket. It has been months since you have resorted to biting so I was definitely caught off guard. After a time-out and an apology to Sophie, you were back to your old self. During these past few months, your sleep has shortened. You take a 1 – 2 hour nap most days, but at least once a week you seem to skip the nap altogether. I do my best to make sure you still spend that time in your room reading books quietly. Bedtime seems to be getting later and later. The goal is still 7:30 – 7:45 in bed, but between bath, books, teeth brushing, face washing, and going potty, it is generally at least 8pm before you are in bed. Starting in September you will be attending preschool one day a week at Classroom of Discovery. This is the next step of the mom and tot class that we currently attend. I am so excited for you to go to school in the fall. Although it is expensive, I think the exposure to new friends and new ways to play will be a great experience for you. I can’t wait to go backpack shopping. Between work and school for old mom, the past few months have been very busy. I feel like I am spending too many mornings working, sending email, and talking to students, than having fun with you. Work is very challenging for me right now, and I am really trying to figure out the best plan for us. In spite of all the work, we just had a fantastic weekend. Rocknoceros performed at St. Matthews and the concert was very well attended. You had a blast meeting Coach Cotton, Willie Bob and Boogie Bennie. Almost all of your friends were there, and after the concert you had a great time running like crazy chickens through the grass. A few weeks ago we were lucky enough to spend Easter with Nanny and Nana, when they came for a visit. It was short, but you really enjoyed your time with them. You still refer to the little table next to the couch as Nanny’s table. Jim, Alex, and Missy Yarbrough and Heather, Sophie and Grant Kutz all came to Easter dinner. What fun everyone had hunting eggs in the backyard. You still ask for jellybeans, chocolate bunnies, and marshmallow chicks. Just prior to Easter your dad and I celebrated our seventh wedding anniversary. While we enjoyed a glorious, although short, getaway to a bed and breakfast called L’Auberge Provencale, you had your very first sleepover at your friend Missy’s house. Her parents, Alex and Jimmy, are just wonderful people and we are so blessed that they looked after you. We then watched Missy a few weeks later while they went out on a date. Although Spring has just begun we are definitely enjoying the fine weather. I sure wish our kitchen opened directly to the backyard instead of the high deck. You just love to play outside – running through the grass, kicking balls, sliding and swinging. You love to drag the rake around, and point to doggie diamonds in the backyard. Have I mentioned that we can’t wait until you are old enough to help pick it up? Finally, you have been giving us a good bit of trouble at bedtime and sometimes in the afternoon for naptime. You throw yourself around on the floor and make comments like, “I scamper away. I do not go in my bed.” We try to encourage you to calm down, but some nights we have to resort to taking your books out of your room. I hate to do it, but it sure seems to work. In addition to the nightly tantrums, you have also started pulling the skin off your top lip and picking your nose. I try my best to ignore these new habits and hope they disappear before you go to high school. What a fun summer we have ahead of us.